Cha-don decides to keep the black box video for the time being in order for him to break those baddies apart from each other. Bi-ryung calls to remind him about their appointment later and it seems that she’s going to introduce him to the other three gentlemen. Prosecutor Kwon meets Ji-hoo on his way out and sees the red muffler of Attorney Hwang in her possession. She’s about to send it for lab tests and Prosecutor Kwon is angry that his assistant starts to get suspicious of Se-kwang. He doesn’t want to follow what Kang-seok really wants from them, that is suspecting and not believing each other. The four baddies get together to celebrate Bi-ryung’s appointment as the Chairman of the bank but they are interrupted when Cha-don arrives. Se-kwang doesn’t really look pleased to see him there, but Cha-don breaks a good news to him, which is about a politician getting interested in helping Se-kwang. Prosecutor Kwon feels threatened since the same politician was in favor of him. Cha-don is just playing around them to see their reaction and Prosecutor Kwon thinks it’s wise for him to look for another guarantor on his side, which is Madam Bok. The mood changes when Prosecutor Kwon leaves first and it turns worse when Se-kwang doesn’t admit that Bi-ryung is his girlfriend; instead, she’s just his business partner. He leaves, followed by Reporter Go and only Bi-ryung is left behind with Cha-don. 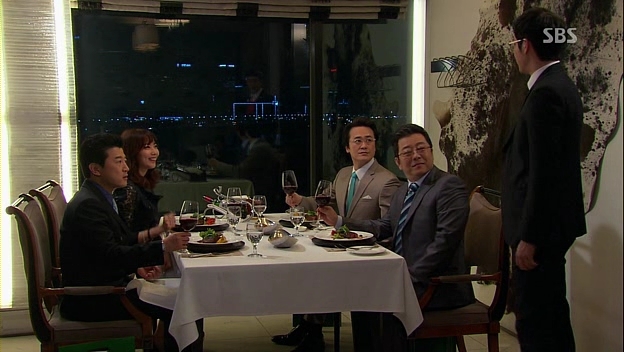 Cha-don takes the opportunity to have a drink with Bi-ryung. She keeps pouring her thoughts to him over the drinks, making her more comfortable around him. Prosecutor Kwon gets hold of the CCTV recording where the car was last seen but he can’t figure out who the culprit was. He tells Hyuk to capture Jae-in’s heart in order to gain the support from Madam Bok. Hyuk doesn’t want to follow his order at first, but soon obeys his father’s wish. So off they go to see Madam Bok. She knows about his intention of getting help from her about getting into the politics and admits that she doesn’t have such power; however, Prosecutor Kwon is ready to give up his shares in the bank and make Jae-in the Chairman in place of getting her help. He asks Madam Bok to let Hyuk date Jae-in as a means for their contract. Jae-in doesn’t seem to be that excited to have a new date but she doesn’t really have any other choice. Madam Bok, on the other hand, tells Mr Kim to report about the matter to Cha-don. Cha-don is excited to know that the baddies have started to suspect each other, but his excitement evaporates when he gets to know about Hyuk’s intention to marry Jae-in. He’s pissed off to know that Jae-in starts dating Hyuk and demands to know where they went to. Mr Kim reports it to Madam Bok, who is the real mastermind behind the mission to bring Cha-don and Jae-in together. She starts to ramble about her love history, happily recording her own story before realizing that she gets carried away. Jae-in doesn’t bring Hyuk too far away and chooses her own Italian restaurant as their first date destination. She doesn’t really pay attention to the clueless puppy (that is Hyuk) but soon realizes that Cha-don is there, monitoring her every move. She starts to act all lovey-dovey with Hyuk, trying to see Cha-don’s reaction. Manager Yang and Secretary Hong know that he’s there to spy on Jae-in but he doesn’t admit it. He leaves without approaching Jae-in, afraid that Hyuk will suspect something. Jae-in is mad that Cha-don completely ignores him and curses him, but poor puppy Hyuk thinks she’s cursing at him. Cha-don doesn’t feel that good and chooses to lament out his anger on the street. The board of directors of the bank get together for their first meeting and everyone introduces themselves, including Bi-ryung and Cha-don as the legal representative of the company. They have a surprise guest that is Jae-in, who has been elected as the director for the audit committee. Bi-ryung isn’t pleased with the development, but she can’t object to the decision made by the shareholders. Jae-in gets the chance to argue with Cha-don and warns him not to challenge her. Hyuk suddenly makes his appearance to treat her for a meal and she happily agrees to it in front of Cha-don. Bi-ryung is about to ask him out but he’s not in the mood to do so. Cha-don is actually planning something for Se-kwang and he gets to use the recording of Prosecutor Kwon’s voice when he went to meet Madam Park. Se-kwang is surprised when Prosecutor Kwon said that he’s sure of Se-kwang being the real murderer of Chairman Lee back then. Se-kwang then gets to chat with Kang-seok, who warns him to be aware of Prosecutor Kwon. He recalls the conversation he had with Ji-hoo, talking about all the evidence being perfectly wiped off and it might be Prosecutor Kwon’s doing to hide his own crime. Se-kwang overhears Prosecutor Kwon talking with his assistant and he gets to know about two things: Kang-seok had contacted Prosecutor Kwon before him and Prosecutor Kwon has started to suspect him, even to the extent of joining forces with Madam Bok. He recalls about the last time he met with his father at the prison. Although his father was sick, he wanted Se-kwang to serve Chairman Lee well as the man did everything that he couldn’t do as his father. 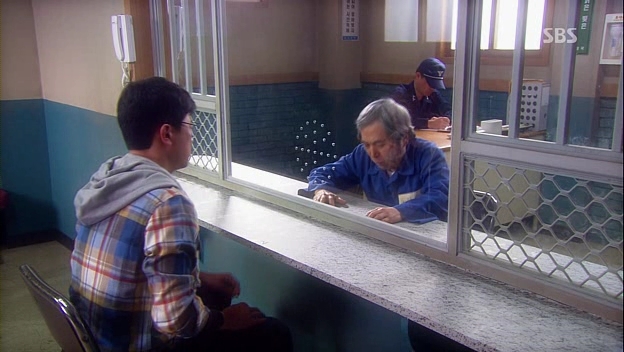 Se-kwang’s father wished to have some walnuts but the next time Se–kwang went to the prison with the walnuts, his father had already passed away. He vowed to get rid of all the injustices in the world to prevent someone from ending up just like his father. After pondering about Kang-seok for some time, he suddenly thinks of the muffler and decides to check on the leftover blood from the DNA test. He looks like he’s found the way to frame Kang-seok as Attorney Hwang’s murderer. Madam Bok is surprised to see Jae-in sleeping together with books on her bed and Jae-in is actually reading all her old accounting books to prepare herself for her new job. Madam Bok is happy to see her changes and ‘blames’ it all on Cha-don and love. Jae-in wants to start her first day by doing an overall audit and Bi-ryung gets to know about it. Bi-ryung calls all the audit committee members out to treat them. Jae-in isn’t someone who easily backs off and she manages to make them help her by giving them a little ‘warning’. Cha-don sticks together with Bi-ryung for the treat but he’s actually planning to put a recording device in her shoes in order for him to spy on the baddies’ conversation. Se-kwang plans to tell the other baddies about his brilliant plan but Cha-don also joins their gathering. He’s suspecting that Cha-don is trying to spy on them and raids all his belongings in his bag. Bi-ryung feels offended by his action while Cha-don is secretly enjoying this side of Se-kwang. After that brief conflict, they start to discuss about the murder of Attorney Hwang. Bi-ryung freezes at the mention of the murderer and looks disturbed, although Se-kwang doesn’t really care who the real murderer among them is. He wants to use the muffler to frame Kang-seok as the murderer. Se-kwang tells Bi-ryung to go out before he tell the others about his plan as he doesn’t want her to go blabbing about it in front of Cha-don. Bi-ryung goes out and Cha-don takes the opportunity to retrieve the recorder from her shoes when she breaks the shoe’s heel. However, things didn’t go as planned since Bi-ryung went out before the other three discussed about the plan. Cha-don knows that Se-kwang is trying to make him the murderer but he doesn’t know how they will do it. He goes to Se-kwang’s office to search for clues but nothing is found. He starts to think about the plan….and remembers that his DNA in the blood is the only proof of his existence as Kang-seok. He’s confident that Se-kwang is going to use the blood to make him the killer. Later, Cha-don goes to fetch the drunken Bi-ryung to send her home and unknown to her, he’s planned something exciting for her. He tells Manager Yang to follow her secretly to scare her and write a message on the elevator, saying that she’s the culprit who killed Attorney Hwang. The scared Bi-ryung enters her house to find everything scattered as if someone entered her house. She calls Se-kwang, but he’s too busy chatting with Kang-seok. Bi-ryung doesn’t have any other choice but to call Cha-don and hugs him when he arrives there. He tells her to check if she lost anything and secretly anticipates her reaction when she goes into the bathroom. She sees another message from Kang-seok on her mirror, together with a pearl necklace. It reminds her of the threat that Kang-seok made fifteen years ago and screams before she faints. This episode is a bit toned down from last week but that doesn’t make it less exciting. I definitely had a good laugh during Jae-in and Hyuk’s scene, because he’s just a clueless lost puppy! Sometimes I just want to hug him, but I really want to see him becoming an honest prosecutor, not like his father. It will be interesting to see how this father and son pairing will end up, whether as a family or just enemies. Cha-don is too lucky to have his plans go smoothly before this and it’s expected to see Se-kwang planning his counterattack. I don’t really want to see Cha-don gets defeated again, after all these years of waiting without any clue of what happened before, but a smart villain is something welcomed in my book of drama watching. I hope that Cha-don gets to keep his real identity a secret for a while and just like what he said to Se-kwang, he will show himself as Kang-seok on the day of Se-kwang’s downfall.